Hey guys, I am so sorry. I know I haven't updated in a long while but I have been having my attention pulled in so many directions lately. I can barely keep up. I was following up the elections, feeling a little off for a while then work seemed to be getting a little too much lately so I feel tired by the time I am free. Then I am seriously preparing for the training coming up this Saturday so it has been a little bit crazy. But don't worry once the training is over I would be back and better. I have so much to talk about. So how did the elections go at your side (for Nigerian residents)? It was pretty okay here even though we heard of ballot boxes snatching and violence at some places. The next day there was a serious protest because a lot of people did not have the opportunity to vote. However everything seems calm for now (I hope it stays that way). Okay, I have to run. 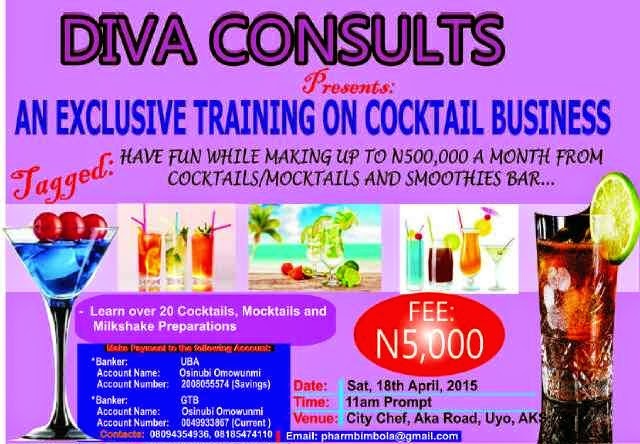 Remember that the cocktail, mocktails and smoothies training is is this Saturday (18th April 2015) at Citi Chef, Aka Road, Uyo by 11am. Fee: N5,000 Please be there and tell a friend or family member. Is it weird that everytime I hear, 'I have a lot to tell you', my ears just stand up like that of a goat?....hehe...Mami, get back in here and drop them gist!! !